← Infographic: How Much Online Support Does Girl Guides of Canada Have? 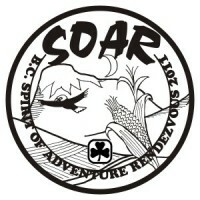 Each time the BC Council of Girl Guides of Canada holds a SOAR camp, “Spirit of Adventure Rendezvous”, the girls choose their program selection from each of the following areas: active recreation, crafts, environment, fine arts, science, waterfront, day trips and service. The service projects being offered made me realize that each girl at SOAR 2011, all 1400, would be doing 2.5 hours of service in the community. That works out to 3,500 hours of service! I got to thinking that all branches of Guiding are involved in doing community service locally and globally. However, our small contributions at the unit level are usually not given much recognition until we tally them together with others. The National Service Project 2011 allows units to register service and currently the counter says 6,660 hours. I am sure that there are hundreds more hours done that haven’t been registered – including the service that happened at SOAR this past week – a minimum of 3,500 hours! The latest information based on a 2007 study of volunteers and donors said that 46% of Canadians ages 15 and over reported that they volunteered. Of that 46%, the top 25 % contributed 78% of the total volunteer hours by Canadians. I think many Guiders fit into this category as it really isn’t just one hour per week of volunteering. In addition, I am sure if we could poll all of our former girl Members many would be volunteers in some capacity as well as adults. After all, our programs promote caring citizens of our communities. So, for all the units out there that do service projects with no thought of getting rewarded or getting media coverage, you are an integral part of all the service that Members of Girl Guides of Canada do! Maybe the organization as a whole will get recognized for all the service it contributes to across the country! How do you feel about community service? We’d love to hear from you! This entry was posted in Awesome Activities and tagged BC, community service, National Service Project, NSP, SOAR, Spirit of Adventure Rendezvous. Bookmark the permalink.